Last night, SP's family gathered at Bahama Breeze to celebrate SP's dad's birthday. Every time there is a birthday, the birthday person picks the restaurant and the family gathers and treats the birthday person to dinner. We started off with appetizers of Island Onion Rings and Grilled Chicken Wings. I love the BB onion rings despite the small flakes of coconut in the breading. And dipped in the citrus mustard sauce? Delicious! I don't like wings much, so I didn't try those, but they must be tasty because they quickly disappeared. Several people ordered the black bean soup and said it was very tasty. For dinner, I ordered a Grilled Chicken Cobb Salad, my usual BB meal. It comes with 2 dressings: Blue Cheese & Island Vinaigrette. SP ordered Jerk Painted Salmon with mashed potatoes & some other side that I forget. I'm not sure what everyone else ordered - I think there was a tilapia dish and a chicken pasta dish, but everyone seemed to enjoy their meal. For dessert, SP & I decided to share an Irish Coffee. 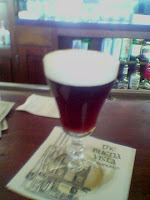 My first Irish Coffee was at The Buena Vista in San Francisco in 1993. The whole experience was heavenly. Sitting at the long bar, watching the bartender create the beverage: pre-heating the glass with hot water, dissolving 2 sugar cubes in coffee, adding the whiskey, and then topping it with lightly whipped cream poured over a spoon. I lived in Monterey, CA for 2 years, and every time I went up to SF, I went to the BV for Irish Coffee. Sitting at the bar, smelling the ocean, feeling the breeze, hearing the cable cars clang past, and sipping the best Irish Coffee ever - wonderful. Since leaving the west coast, I've tried many Irish Coffees, but they've never been as good. I started to think that maybe my memory just wasn't that great, maybe the BV Irish Coffee wasn't really that great, after all, how could it be that no Irish Coffee measured up to the BV drink? 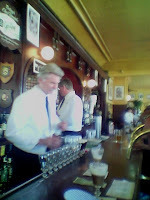 After a nearly 8 year absence, I returned to SF in 2003 and went to the BV and ordered the Irish Coffee. Oh such a delight. My memory was oh so right. I am still searching for an Irish Coffee as good as the one at BV. BB's is OK, but whipped cream on top? No, no, no!! SP made everyone laugh when he took a sip and tried to slurp some whipped cream but ended up slurping up the entire swirl of whipped cream, leaving me none. He's lucky I love him!!! !